10 Unique Games to Make RV Travel with Kids Fun for Everyone! Alphabet Game – A competitive version of an old classic. Each player must start by naming an object that begins with a letter of the alphabet, starting at “A.” No repeats! The first person to get to “Z” wins. List Game – Each player or team develops a list of 10-15 things you see when driving, each need to be different, first one to scratch off their whole list wins. This one is a great distraction! License Plate Challenge – Find license plates of other states, say the state, then the next person must find a plate that starts with the last letter of the previous plate (i.e. Iowa means find a plate that starts with A) and then name that plate’s state, etc. Map Hunt – Get your kids reading maps! One player locates a small town or river on a map and the other players have 30-60 seconds to find it. Set your own max score for a winner. Printable Disney Activities – For your Disney fans, check out this list of Disney-inspired activities, including many that can be easily printed off as you prepare for your trip. Rory’s Story Cubes – Encourage their imagination with Rory’s Story Cubes (available on Amazon), a game where you roll the dice and have to invent a story based on how they land. Or you could create your own similar game by drawing on paper or flash cards and shuffling them. Round Robin Story Telling – A classroom favorite, this one not only lets kids get creative, it can also help with grammar. Each player speaks one word in a story, going around with every participant. Keep going for a few sentences or until the story comes to a natural end. Create A Bingo Board – Let everyone create a car bingo board with common sights, restaurants, or more on the trip. For extra difficulty, let everyone know they’ll have to pick a board at random before the trip so nobody makes one too easy for themselves. License Plate Acronyms – Spot a license plate then let everyone create an acronym based on the letters. The best or funniest acronyms win. Alphabet-athon – In this game, name a letter and each player must fill each category with a name, place, or object that matches the category using the given letter. You can print off Alphabet-athon game sheets here, or consider making your own with new categories to keep it interesting. All the word games and toys in the world can’t stop kids (and maybe even you!) from getting exhausted of the road. Make sure you designate some time to step away from the driver’s seat! Don’t just expect meal stops to show up when needed. Check your route and plan your meal stops when and where they make the most sense. For bigger Travel Trailer RVs, keep in mind it might not always be easy to just pull into any stop or fast food restaurant you come across! There are plenty of interesting places to stop along the road in every state! Roadside America is a great resource to plan odd stops. And if your trip doesn’t go through particularly interesting areas, consider geocaching. This gadget-reliant game uses your phone and GPS to locate secret treasure (caches) hidden all over. Make sure to put them back when you found them to not spoil the fun for other geocachers! Unless you’re using this road trip to “disconnect” from electronics, consider loading up movies or shows on your mobile devices before you go. This will give your kids something to quietly enjoy while you focus on the road or relaxing. Of course, naptime is always a great fallback for passing the time too. 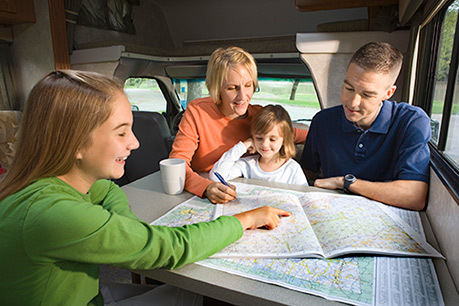 There are many styles of RVs out there, make sure you pick the right one for your family. If you plan to bring the kids along, you might want to consider a bunkhouse RV to give everyone enough space to be comfortable, as well as having a little “place of their own.” It really helps! If you’re not sure that a bunkhouse RV is a good fit, check out 5 most popular RV styles from last summer and discover what fits with your needs! Packing can be surprisingly difficult! For long trips with your whole family, you’ll likely find that the “less is more” approach works best. Sure, the kids may have a closet full of toys, but you will want to stick to just a few of their favorites, encouraging them to choose smaller options. Here are some tips on maximizing storage in a small RV. The same can be said of clothes! Don’t bring something specific for every possibility. Pick out good all-around outfits that are durable and easy to wash.
You’ll always be surprised how quickly a neat and tidy RV can turn into a disaster area. One of the best ways to stay on top of it, as well as giving your children a sense of responsibility, is to have a planned cleaning routine and make sure they do their parts. Kids need to play and if they’ve been on the road for a few hours, they’ll want a good opportunity to stretch their legs just like you will. Don’t forget to bring what you need for fun outside the RV. Bikes, footballs, and other outdoor games are perfect to break up the road trip a bit and can give the whole family an activity to participate in together. This is a no-brainer! The journey is only half the fun – don’t forget about the destination. Many of the best locations to camp have a variety of activities for you and the kids. Pick a place that has age-appropriate amenities. For younger children, many camp areas will have playgrounds to run around. If you have teens, consider locations with good opportunities for swimming or exploring. These seemingly simply activities can create lasting memories for your children. Capture these moments to share with them when they are older! Consider taking all your photos and creating a collage for each unique trip, or even by location. Download our free RV coloring sheet!